We are proud to offer secure, highly configurable firearms storage to keep your weapons and accessories safe and organized. To purchase single, pre-configured firearm lockers for pistols, rifles, and shotguns, please call us today! Preconfigured units are 76" tall, in widths of 24", 30", 36", 42", or 48" to store 7-15 pistols and 7-15 rifles, for total storage of 14-30 firearms (dependent on the width of the locker). An ammunition/gear shelf is included with preconfigured units. Click on the pictures below for more information! For custom configurations or full-storeroom solutions, please call us at (800) 447-0834 for a free quote and consultation. We have served the law enforcement community for over 40 years and our experienced storage specialists can match you with a complete system to meet your specific needs. 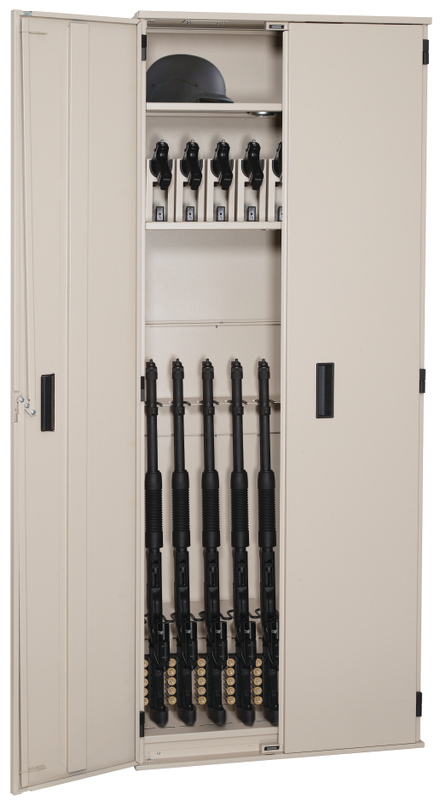 For large applications, our firearm lockers are also available as mobile storage units (crank-to-move storage on tracks). Previous law-enforcement clients have also found mobile storage to be a perfect solution for storing and organizing evidence archives in a small footprint. Call today for more information! Our filing specialists will custom-design a storage solution to fit the exact needs and dimensions of your existing office space. You do not need a new storeroom - in fact, you will find that you will have more space left over after installing our space-saving shelving! Our factory-trained installers have years of experience, with a track record of many successful installations. From our first CAD model of your storage space to the final installed product, we are so proud of our installation process that each one is guaranteed for two full years!